This year’s Trendsetter Awards Gala was fit for a princess. What better way to end our year than an enchanted emerald evening at the Disneyland® Hotel. Magical Cello music set the ambiance to our royal ball as we entered into the cocktail hour. We enjoyed catching up with old friends and making new ones as we posed with Mickey and Minnie for photos, and enjoyed a silly moment with Joy Squad in their photo booth. 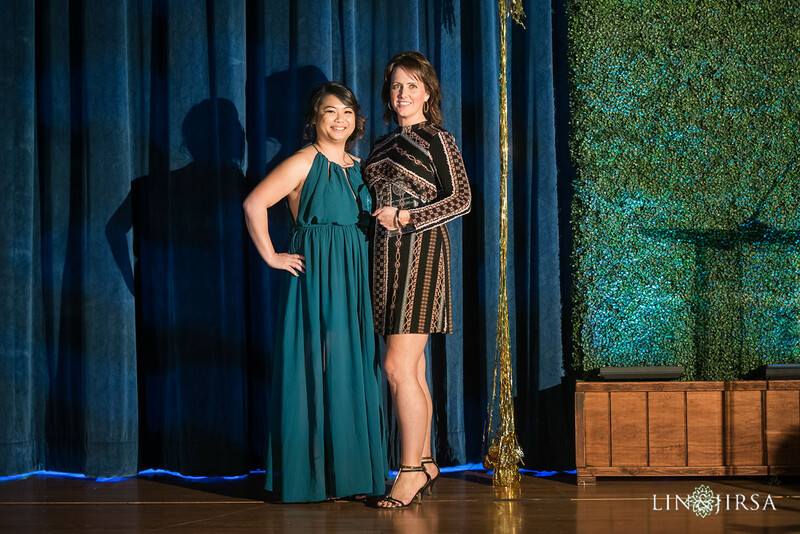 Kerrie Underhill and Kelsey Connelly really know how to plan and design a dazzling event that impresses from start to finish. 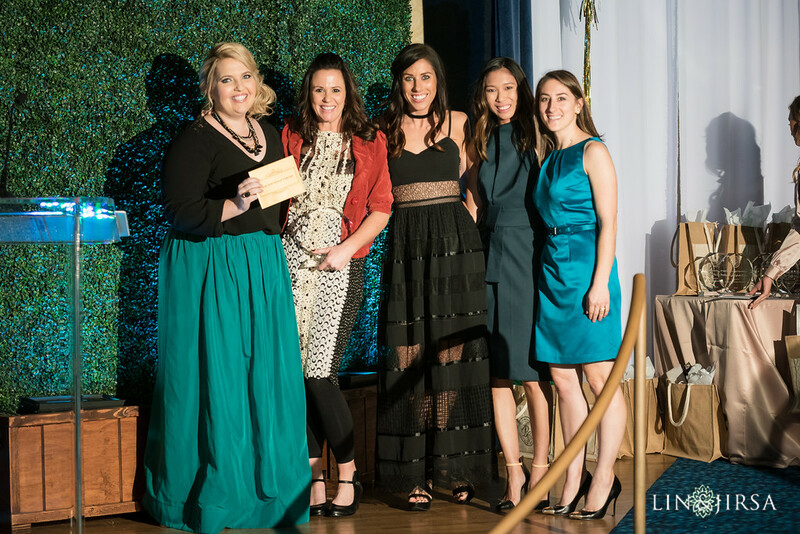 We congratulate all of this year’s winners on truly elevating the industry standard. As we entered the emerald soaked Disneyland® Grand Ballroom our eyes were met with floating centerpieces, cascading orchids, and elegant crystal chandeliers. Flowers by Cina really knows how to transform a ballroom into a real life fairy tale. Guests were treated like royalty and could even pose with Cinderella’s Crystal Coach. We eagerly anticipated the announcement of award winners as the presentation started and our elegant dinner service began. Pixie dust filled the room as each guest received an ice slipper filled with apple sorbet to cleanse their palates before the main course was served. As the awards concluded The Young Guns Band got the party started on our custom dance floor provided by Chiavari Chair Rentals. We danced until the clock struck midnight, and we had to return to reality. 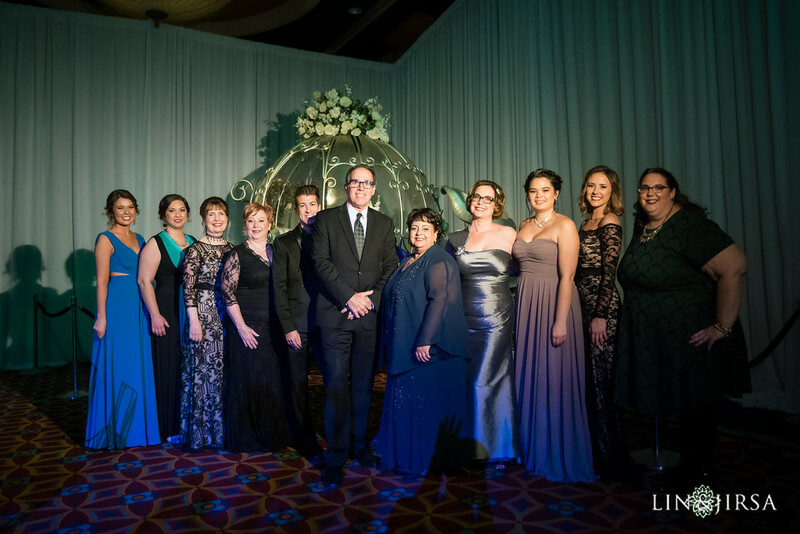 The evening was truly a testament to how Orange County Bridal Consultants are continually impressing other chapters across the nation. What a way to end the season. Until next year! Usually when someone hears the word “casino,” they either picture dollar signs or a negative bank balance. However, there was nothing negative about the Casino San Clemente at our meeting this July. Upon arrival, guests were handed a signature cucumber cocktail as they mingled their way to the Patio of the Stars. There, vintage furniture provided by FOUND created a stunning and welcoming atmosphere, only to be enhanced by The Pink Daffodil’s centerpieces and bouquets. 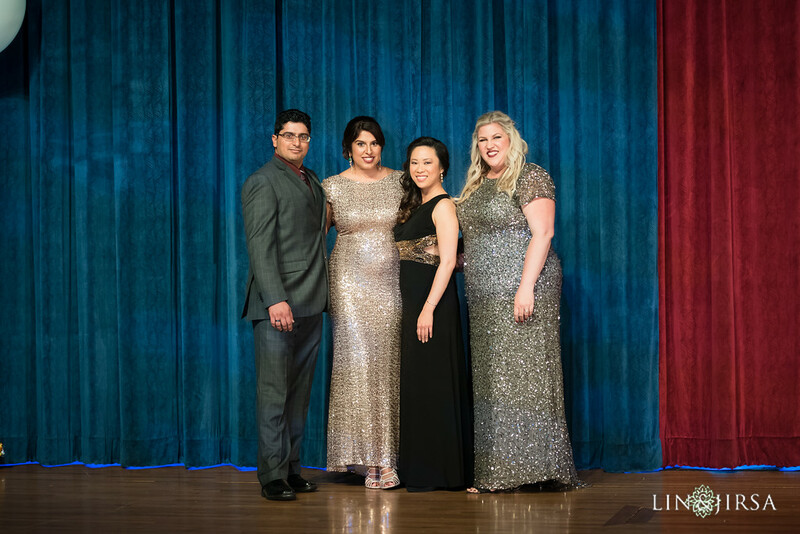 The ambiance of this stunning casino was perfectly paired with the musical styling’s of ­­­­­­­­­the Kalama Brothers. Guests could even venture to the Rock Garden to see a beautiful ceremony set-up that FOUND had also fashioned. Between the décor and the shabby chic venue, our guests were in a wedding professional’s heaven. There were even models in Casablanca Bridal wedding gowns floating around! Later in the evening, everyone fled into the Ballroom, which was beautifully accented by a crystal chandelier and exquisite linens by La Tavola Fine Linen. Vive Entertainment, Inc. kept the vibe going by taking requests and even getting a birthday jingle started for Co-Director, Kerrie Underhill. Kerrie then handed the floor over to long-time officiant, JP Reynolds, who reminded us all “what makes the best the best.” After a few light hearted stories and helpful tips, dinner was served. Iva Lee’s already wowed us at the cocktail hour with their Cauliflower Cakes, Zucchini Rolls, and Ginger Scented Chicken Sugar Cane Lollipops. However, they really outdid themselves with the following courses of Thai Strawberry Watermelon Salad, Local Seabass, and Filet Mignon. Just when we thought it couldn’t get any better, Luisa Chocolatiere had been working in the West Wing to set up a buffet of chocolate covered strawberries, pretzels, Oreos, the list goes on. They were so delightful that a few marshmallows might have “accidentally” fallen into some purses before heading home. Ultimately, the evening had to come to an end, but not without some Cupid Shuffling on the dance floor first. During these busy summer months, it’s always nice to kick off your own shoes and bust out your favorite dance moves! Events by Cori, in addition to Jill Watson from the Casino San Clemente definitely gave us all a night to remember. Hair & Makeup: Flawless Faces, Inc.
There’s nothing quite like an ocean view and although this Earth is primarily water, it’s safe to say The Montage Laguna Beach offers one of the best in the world! Our Coordinators were reminded of this at our June luncheon. However, our sight wasn’t our only sense getting spoiled. It didn’t take long for our members to notice the scent in the air, and no, we’re not talking about the ocean. Pastiche Perfumes was there promoting their amazing fragrance bar. Guests were able to choose from an array of different scents and combine their favorites, thus creating their own custom fragrance. As our members were spritzing their new perfumes, tray passed hors d’oeuvres and champagne were making their way throughout the lawn. Our taste buds were in heaven, but it didn’t stop there! Once we were welcomed into the luncheon, Chef Craig Strong of The Montage Laguna Beach was there to answer questions on trendy dishes and explain just what we were going to be dining on. The description alone was enough to make us weak in the knees, but the actual taste was beyond expectations. If there’s one thing we’ve learned at our meetings, it’s that you can never have too much dessert and Sweet Lady Jane was there to take our senses over the top! 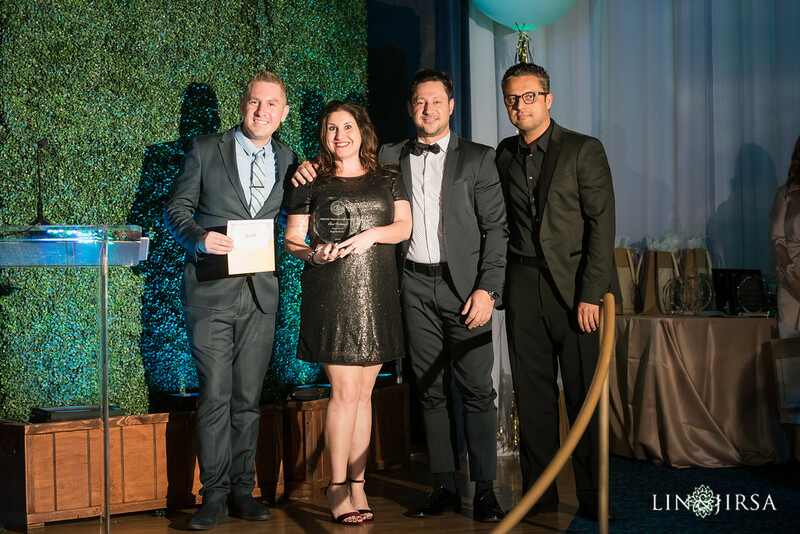 Everyone collected a delicious treat (or two or three) and brought them back to their table adorned with fabulous linens provided by Mikasa Fine Linens. They were a “touch” of perfection. And of course, DJ Chris Rox was there to set the mood and provide the tunes. Thus, our five senses got a work out this day, but what would one of our meetings be without the sixth sense, a sense of humor. A huge thank you to all our members who continue to laugh, enjoy, and most importantly make connections! Lion, tigers, and bears…more like cheese, wine, and mingling oh my! This month’s meeting was held at the fabulous Rancho Las Lomas Resort and Zoological Garden on May 10th. As guests handed their cars over to the valet, a few zebras made an appearance, but let it be known they were not the only “party animals” in attendance. Kelsey Events outdid themselves once again, bringing together some of the best vendors in the business to give us this year’s most social event yet. While we usually host a phenomenal speaker of some sort, this month focused on just getting to know one another! And we all know there’s no better way to mingle than over wine and delicious cheese arrays provided by 24 Carrots Catering & Events. To add a little entertainment to the evening, guests were handed a fill-in-the-blank game, where the answers were actually names of your fellow guests. Thus, while everyone was on the hunt for those who can quote “Father of the Bride” or who have spent over ten years in the industry, business cards and crazy stories were exchanged. When guests weren’t racing to get their games filled out, they were either lounging on the classic furniture provided by Found Vintage Rentals or busting out their best dance moves to music performed by Undercover Live Entertainment. Overall, there were laughs, there were introductions, but most importantly there was a candy bar by Hollywood Candy Girls! It was the perfect cap to such a sweet night! A night at the museum? Don’t mind if we do! Except unlike a normal visit to Bower’s Museum, signature pineapple martinis and delightful appetizers filled our fists instead of a brochure. We were greeted, per usual, by a familiar face, a name tag and an open bar. The first hour was used to mingle, form connections, reminisce on the good times, and of course, satisfy our appetite. Once the cocktail hour in the Huang Sculpture Garden was nearing an end, the doors to Bower’s Great Hall opened and guests began taking their seats. Yellow tulips in square glass vases arranged by Flawless Flowers served as the centerpieces, atop clear, acrylic tables with textured, navy runners provided by GBS Linens. This contemporary design with a pop of color was met by some history with ancient artifacts lining the walls of the museum. Leila Lewis took to the stage to discuss PR tips and the power of positivity. She stressed on the importance of working with your fellows vendors, especially when it comes to publicity. She opened the floor for questions and once that was finished, we dined on the impeccable catering of Patina Restaurant Group. Finally, we capped off the night in the back courtyard with some cappuccino from Brew Ha Ha. It was such an exciting evening, even the mummies in Bower’s new exhibit were coming to life! Our Havana Nights soiree was a blast, ending our summer on a high note. Located in Huntington Beach, Venue by Three Petals definitely knows how to throw a celebration. The lavish area was filled with tropical colors, making this one HOT ending to our busy summer. The light up bar invited guests to try their themed drink of the evening. Cuban food stations and tray passed delights were a plenty throughout the beautiful space. Sprinkles Cupcakes served ice cream for dessert, while Urban Espresso offered wonderful coffees and espressos perfectly capping off the night. The dance floor did not stay empty long thanks to Visions Entertainment who provided the music and lighting for the event. El Canito Cigars really played up the theme with their cigar bar stationed on the patio. If that wasn’t enough to keep you entertained, Vox DJ’s had fun props to pose with in their photo booth and Water Tree Events provided a Video Dare Booth… The question is, did you dare to try it out? The “plus one” was a nice touch as guests loved being able to bring their significant other and friends to the party, adding a whole new level of networking. It’s no surprise that this “meeting” was one of the highest in attendance. It’s safe to say, there was no better way to conclude our summer! ABC OC Havana Night Highlight Video from Water Tree Events Videography on Vimeo. Kelsey Events put on an amazing July meeting. Breathtaking views, signature drinks, and exquisite décor certainly created a night to remember. As we set our eyes on the venue we were immediately immersed into the amazing architecture of the Santiago Canyon Estate. Casual mingling among friends poolside seamlessly turned into an elegant dinner under the stars. Upon arrival to the upper level our eyes wandered from the enchanting table settings, to the stunning floral arrangements, to the dessert table. The lounge style seating for our speakers was perfectly put together in all white with pops of fuchsia. The tropical centerpieces with Magenta Phaleonopsis Orchids and Ti Leaves completed the event’s overall look. It’s always inspiring to hear success stories from our peers. 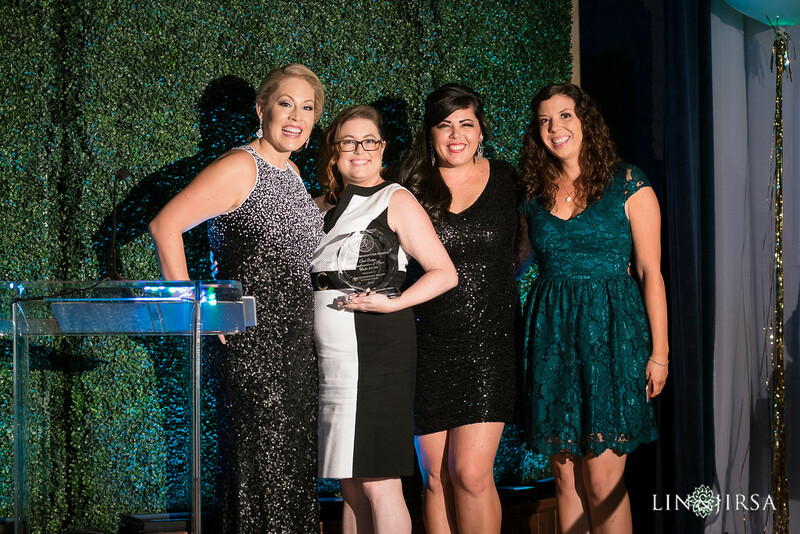 All three speakers are considered some of the top Event Planners in the industry. Their success in business goes hand in hand with their love for their clients. 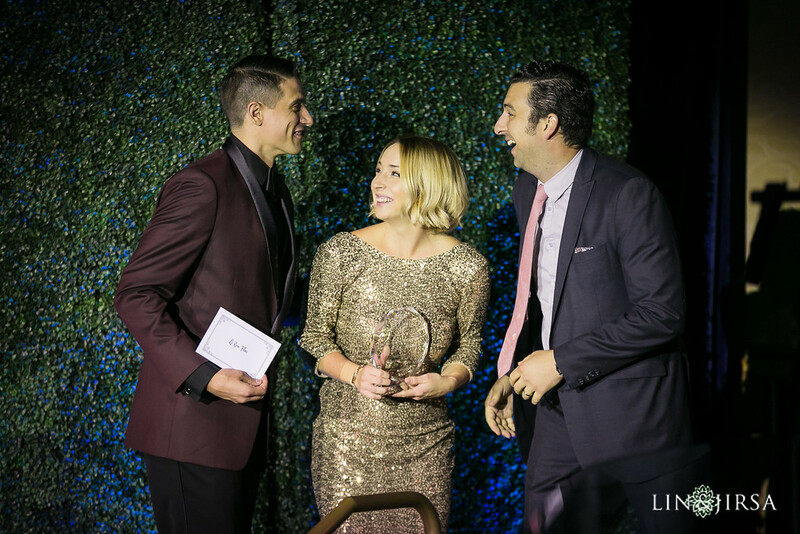 Brooke Keegan emphasized having great relationships with your vendors to ensure a flawless event. 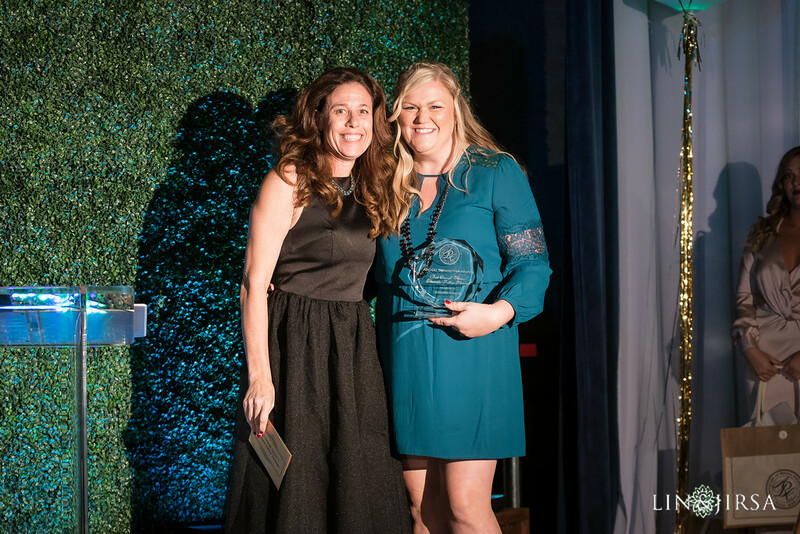 While Lindsay Longacre’s leaderships skills have helped her build a strong event company that offers training for aspiring event planners. Since entering the industry in 2004 Wendy Dahl not only runs a successful event company but also coaches wedding professionals. All of the speakers enlightened the group with their past experience and how it contributed to their achievements over the years. From making the decision to join the industry, to where they are now has been quite the journey for each of them. It was truly an honor to hear each of their stories. Jason’s Catering provided a delectable menu that certainly did not disappoint. The hearty portions were delicious. The dessert table by Pacific Patisserie Bakery had so many choices it was hard to decide which ones to bite into. Brew Ha Ha’s gourmet coffee station with fresh beignets really hit the spot at the end of the night. Our June coordinator’s luncheon at the Colony House was a fabulous way to start the summer. Not only did we have top notch vendors filling the room with a fresh summer citrus palette and relaxed atmosphere, we also had some expert presenters teach us a thing or two about how to improve and sharpen our planning skills. Lavender’s flowers was the key to the event design. Starting with shades of white, she pulled in tangerine, grapefruit and blood orange citrus along with foraged greenery and added a variety of texture. 24 Carrots created a menu that incorporated the design: avocado and mixed green citrus salad with a meyer lemon vinaigrette, citrus mixers for the mimosa bar and a white chocolate citrus cake to finish the meal. Each vendor’s interpretation of the design complimented one another and the outcome was perfection. During the breakout sessions, we were dazzled by napkin folds, quick makeup fixes on our brides, how to create an emergency boutonniere, phone lenses for better pictures at events and some of us caught on to tying a bow tie. We have to give the award for creativity (and courage) to the 24 Carrot rappers who taught us to set a “table with flare.” Thank you so much for sharing your time and knowledge with us. This month was special as we partnered with Brides Against Breast Cancer (BABC) by hosting a fundraising event honoring those that have been impacted by cancer. Erika’s Elegance Weddings and Events put on an incredibly touching evening that highlighted this organization. The Red Horse Barn was a perfect backdrop for our evening as we enjoyed Summit Event Catering and the sounds of Larry by Fly by Night DJs. As we finished dinner and the venue was lit in pink (of course) by Elevated Pulse, we enjoyed a fashion show sponsored by Mon Amie Bridal Salon with MD Hair and Makeup providing their services for our models. Each of our models had a personal connection with someone affected by cancer. Our vendors all did a terrific job coming together to give back to this impactful cause and in addition Katherine Hoggard with Impact Favors educated us on how we and our clients can make a difference at our events by donating to meaningful causes and then passing it on to others in hopes of making an even bigger impact. Videographer Greg Fiske put together a heartfelt video for the event featuring our very own members. Our MC for the evening Tracy from Flawless Weddings and Events shared with us her personal connection to cancer by sharing the story of her mother’s battle. It was eye opening to see that almost everyone in attendance that evening has known someone touched by cancer in some way. Brides Against Breast Cancer (BABC) is a non-profit organization that raises funds to ensure those battling cancer and their family have the resources and information they will need for their journey. 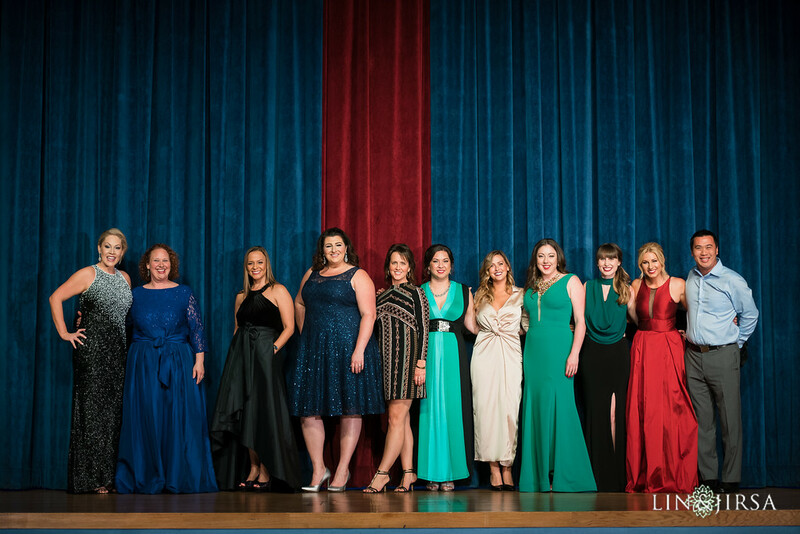 Each year BABC tours the country with their “Nationwide Tour of Gowns”. The funds raised during the tour make it possible to provide the support needed to thousands of children and adults impacted by cancer. During our ABC event we were able to raise $1,161 for the organization. The donations will fund over 20 hours of FREE support for people affected by cancer. Other ways you may consider helping are to donate a wedding gown, volunteer for the organization, host a BABC fundraising event, become a BABC sponsor, participate in their Pink Envelope Project, or Be an Advocate. It was such a pleasure for our organization to come together with Brides Against Breast Cancer (BABC), give back to those battling cancer and to learn what we can do in the future to an impact in assisiting BABC. Thank you to Hilton Huntington Beach, Mastro’s and One Hope Wine for donating our raffle prizes and thank you to all the sponors for a meaningful and memorable evening. A very special thank you to all of our vendors and sponsors for the evening. Andrea Woolf guest speaker and author of “Ignite Your Life” lead March’s meeting with some helpful tips to calm ourselves when things seem to be a bit overwhelming. We all go through some stressful times planning events, and balancing our personal lives, but with her helpful insights we may be able to enjoy them more as well. The Hotel Irvine was gracious enough to host our event this month. Let’s hope our coordinator was not too overwhelmed during the planning process, because the event was seamless from beginning to end. The food stations were amazing. The desserts were consumed quite quickly and then to our surprise, ice cream bars were presented to cap off the night. Thank you to all of our sponsors! We couldn’t do it without you.